Dhelmise in game: 584 Who? Important notice! Pokemon Dhelmise is a fictional character of humans. Dhelmise (Japanese: ???? Dadarin) is a dual-type Ghost/Grass Pokémon introduced in Generation VII. 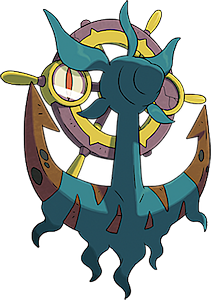 Dhelmise is a Pokémon made up of an anchor and ship's wheel, held together by a mass of green seaweed. The anchor is a rusty brown color and mottled with blackish spots. The seaweed, which is Dhelmise's true body, partially envelops the thick, curved bottom of the anchor in a zigzag fashion, leaving empty spaces that look like sharp teeth. The seaweed continues upward to cover the anchor's entire thin shank, as well as what appears to be a round, nose-like hub on the top. The ship's wheel, colored lavender with yellow details, is affixed to the back of this hub by its center and able to rotate freely. The noticeably damaged wheel features six spokes and four yellow handles, as well as two lavender stubs where the other handles should be. A simple compass, resembling an eye, is set into a ring-shaped component on one side of the wheel; mirroring this is an identical ring on the opposite side, though nothing is set into it. Dhelmise appears to be a cluster of seaweed holding together the anchor and ship's wheel of a wrecked ship. It may also reference the idea of ghost ships. Dadarin may be a combination of ?? tatari (cursed) and ?? darin (rudder wheel).